The Asbestos Disease Awareness Organization (ADAO) is proud to present a weekly series “Meet the Speakers and Honorees,“ which will highlight the esteemed participants of our highly anticipated 15th Annual International Asbestos Awareness & Prevention Conference! 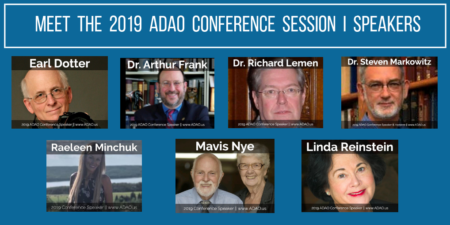 The ADAO conference, which will take place on April 5-7, 2019 in Washington, D.C., combines 30 expert opinions, victims’ stories, and new technological advancements from 10 countries across the globe into one united voice raising awareness about asbestos. ADAO is the only U.S. nonprofit that organizes annual conferences dedicated solely to preventing asbestos exposure and eliminating asbestos-caused diseases. Register here today! Earl Dotter is an Occupational & Environmental Health Photojournalist. Beginning in 1968, after the Farmington, WV mine disaster claimed the lives of 78 coal miners, Earl Dotter began photographing coal miners, then our nation’s most dangerous job, after which, he has focused on hazardous occupations in the USA. In 1998 he created the exhibit and book, THE QUIET SICKNESS: A Photographic Chronicle of Hazardous Work in America. In 2000, Dotter received an Alicia Patterson Foundation Fellowship to document commercial fishing hazards with the resulting exhibit titled: The Price of Fish. After 9/11, he photographed the rescue recovery effort at Ground Zero. For that exhibit, When Duty Calls, A Tribute to 9/11 Emergency Responders he received the APHA’s, Alice Hamilton Award. BADGES, A Memorial Tribute to Asbestos Workers commissioned by the Asbestos Disease Awareness Organization (ADAO) continues to evolve as asbestos use is still remains to be banned in the U.S. Dotter’s LIFE’S WORK, A Fifty-Year Photographic Chronicle of Working in the U.S.A. retrospective exhibit, along with the book of the same name was first launched in September, 2018 at the headquarters of the AFL-CIO in WDC, and was presented in December at the 2018 NCOSH Conference in Baltimore. Arthur L. Frank, MD, PhD is a physician board certified in both internal medicine and occupational medicine and currently serves as Professor of Public Health and Chair Emeritus of the Department of Environmental and Occupational Health at the Drexel University School of Public Health in Philadelphia. He is also a Professor of Medicine (Pulmonary) at the Drexel College of Medicine. He also holds a position at Drexel as Professor of Civil, Architectural and Environmental Engineering. A life-long academic, Dr. Frank has previously taught at Mount Sinai, the University of Kentucky and in the University of Texas System. He has served many governmental agencies in the US and has carried out research and has been a governmental advisor internationally. Trained in both occupational medicine and internal medicine, Dr. Frank has been interested in the health hazards of asbestos for more than 35 years. He has published a great deal of work on the hazards of asbestos, and clinically cared for asbestos affected patients. He has lectured internationally about the problems of asbestos, and worked in many settings looking at the diseases caused by this material. His research interests have been in the areas of occupational cancers and occupational lung diseases, as well as agricultural safety and health. For thirty-seven years he held a commission in the U S Public Health Service (active and inactive) and served on active duty both at the NIH and at NIOSH. Arthur is the ADAO Science Advisory Board Co-Chair. Richard Lemen, PhD, MSPH is a retired Assistant Surgeon General of the United States and also served as the Acting Director and the Deputy Director of the National Institute for Occupational Safety and Health before his retirement. He has been a practicing epidemiologist for more than forty years and has taught graduate level courses on environmental and occupational health issues, including asbestos, at the Rollins School of Public Health at Emory University. He has also testified on behalf of asbestos victims; Dr. Lemen is a world-renowned author, speaker, and lecturer on this topic. Steven Markowitz, MD, DrPH, is an occupational medicine physician, directs the Barry Commoner Center for Health and the Environment (CCHE) at Queens College, City University of New York and is a member of the ADAO Science Advisory Board. He is Adjunct Professor of Preventive Medicine at Mount Sinai School of Medicine. He received his B.A. from Yale University and MD and DrPH (epidemiology) from Columbia University. With the United Steelworkers, Dr. Markowitz directs the Worker Health Protection Program, a national medical screening program for Department of Energy nuclear weapons workers that has since 2000 used low-dose CT scanning to screen over 13,000 workers for early lung cancer detection. Dr. Markowitz has also continued the work of Dr. Irving Selikoff in documenting asbestos-related mortality among North American insulators. Dr. Markowitz served for 12 years as Editor-in-Chief of the American Journal of Industrial Medicine (AJIM) and was the Associate Editor of a major textbook, Environmental and Occupational Medicine, 4th Edition. He serves or has served on Federal EPA, NIOSH, NTP, and DOL Committees or Boards. Raeleen Minchuk is a Peritoneal Mesothelioma survivor from Canada! I grew up in small towns in Saskatchewan most of my life as my parents owned several small-town hotels. I currently am in the only remission I will have during my battle with Mesothelioma. I am the founder and owner of Liga Boca Nueva Mesowarriors a baseball foundation in the Dominican Republic. I started the foundation to create equal opportunity for sport with proper equipment. Our boys are called MesoWarriors because on my journey the people who support me with love and prayers are my MeSoWarriors! It’s been a rewarding experience working with all different age children and creating opportunities for them to advance in a baseball career. We also teach them English finances and how to cope with stress and anxiety during their transition! This has allowed me stay active and healthy contributing to my prolonged survival rate! Mavis Nye is a Mesothelioma survivor from the United Kingdom! In 2009, Mavis Nye was diagnosed with pleural mesothelioma, a consequence of the asbestos fibers that often coated her husband Ray’s uniform from the Royal Naval Dockyard in Chatham. She was told that she had 3 months to live. However, rather than accept this prognosis, Mavis decided to fight. She fought in treatment, and by getting involved in the MesoWarriors, an online support group that assists asbestos victims and their families. Today, almost nine years after the three months she was originally given to live, Mavis —and Ray—continue their work with the MesoWarriors, which allows Mavis to share her story across the UK and around the world giving hope to asbestos victims and demanding change from people with the power to create it. As she puts it, she has been given another chance at life so that she can help other sufferers. Linda Reinstein is the President/CEO and Co-Founder of Asbestos Disease Awareness Organization (ADAO). Reinstein became an activist when her husband, Alan, was diagnosed with mesothelioma in 2003. She co-founded the Asbestos Disease Awareness Organization in 2004, and now serves as President and CEO. Reinstein has been a strong political voice for justice in every major asbestos-related issue. Reinstein, a highly sought-after international speaker, has frequently served as a Congressional witness and presented at the Department of Labor (OSHA), British House of Commons, United Nations Congress, American Public Health Association, and to other audiences around the world. Recognized as an expert with nearly 40 years of nonprofit experience in building and sustaining grassroots organizations, Reinstein specializes in developing, implementing, and leveraging integrated social media campaigns. Over the years, Reinstein has been asked to create social media educational materials and facilitate workshops. Focused on national and international occupational and environmental disease prevention, Reinstein’s proficiency in the powerful advocacy space of online media has greatly increased the effectiveness of ADAO’s core mission of education, advocacy, and community support actions. She has won many prestigious awards including the Global Impact Award (2013), from the Independent Asbestos Training Providers; Bruce Vento Hope Builder Award (2011), from the Mesothelioma Applied Research Foundation; the highest level of the Presidential Volunteer Service Award for her 4,000 hours of volunteerism during her lifetime (2010); and the Heart and Soul Award in from the Manhattan Beach Women in Business Association (2005). Check back next week for the second installment of “Meet the Speakers and Honorees” featuring our 2019 conference Session 2 Speakers.